360 Security is a leading free security application for Android mobile devices. 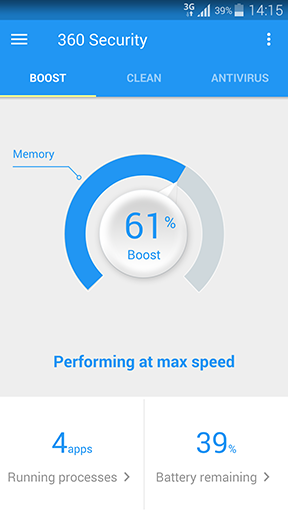 It is considered both an antivirus and a device optimization application, because it easily cleans up your device to give you more space and boost its speed. A new app called Facebook spy allows users to monitor your cell phone activities including SMS, MMS, Facebook, and phone calls. 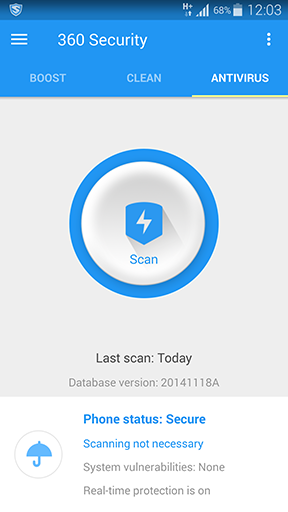 Scanning the content on your phone in its entirety is done quickly and with ease. Anything that you have downloaded or saved is scanned initially, and then anything that you add will be scanned as well. If potential threats are detected, it will be taken care of right away. You get the security that nothing on your mobile device will be jeopardized. There is comfort in knowing your personal data will be safe and secure. If you have a memory card installed, it is scanned and protected too. Viruses, malware, trojans, and other threats are no longer an issue for your phone. You are protected in real-time as you browse the web and download apps. 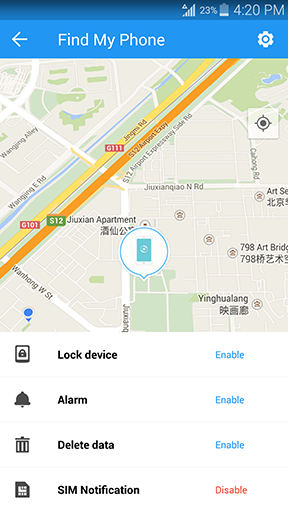 If your phone turns up missing, you can easily track it with the online interface. If it is stolen, you can sound an alarm in an attempt to deter the thief from using it. You have the ability to lock it remotely, so the chances of your data being compromised are lessened. If all else fails, you can easily erase your entire phone, which means you will not have to worry about your data getting into the wrong hands. If you are concerned about someone picking up your phone and going through your private information, you can use it to lock specific applications. Even if someone picks up your phone, they will not be able to access private information. You can lock your settings so that you don’t accidentally change them. This is also helpful if you have children and they tend to get your phone. You won’t have to worry about little fingers changing the language to Japanese or changing other important details. You also have the ability to lock down your data. So anything that is stored on your phone or your memory card can’t be sent or transferred elsewhere. The One Tap Clean feature scans your phone to remove useless caches and redundant data, which will free up space on your device. It also frees up and boosts your RAM. You can use this daily to make sure that you get the most out of your phone’s included space. This feature will also help the life of your battery. It is automatically triggered to clean up and clear out, so your phone uses less power to run applications in the background. 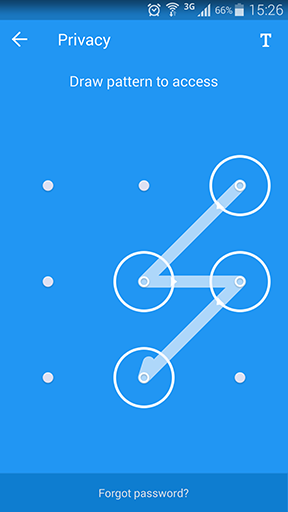 The App Manager allows you to control all your applications from one screen. You can uninstall or move applications to free up more space. The 360 Security App is the ideal way to protect your private data that is on your mobile device. Worrying about attackers or harmful threats will be a thing of the past. In addition to securing your data and protecting your phone, you can use it regularly to make the most out of your phone’s speed, storage, memory, and battery.